It caught everyone's fancy from the time it was first leaked in a video, and since then, all Android enthusiasts, and especially the ones who swear by the pure stock user interface of the operating system, have been eyeing this smartphone. No prizes for guessing, we're talking about the Nexus 5, Google's new platform showcase device which has been manufactured by Korean electronics giant, LG. It's also the first time that Google has launched its flagship device in the Indian market just weeks after its international launch. The pricing of the phone and the promise of priority software updates makes it an irresistible proposition. So, how does it perform in real world conditions? We put it to test and find out in our review. The Nexus 5 sports a very understated look and there's nothing really striking in the phone's design that will shout for your attention. The phone is made of plastic and doesn't feel very premium. However, when you place the phone in your hand, you'll feel that it's very pleasant to hold thanks to the soft touch matte finish. Also, despite its large 4.95-inch screen, we didn't face any issues operating it with one hand. This is also due to the phone being quite lightweight at 130 grams. The Nexus 5's edges are less curved and its corners less rounded compared to other phones, including the Nexus 4. The phone is available in Black and White colour variants and we got a Black one as our review unit. The 4.95-inch full-HD display dominates the front of the Nexus 5, and there are no hardware buttons. A round LED notification light is placed below the display, while the sensor array and the front camera sits above it. The right edge of the Nexus 5 features the Power/ Screen lock and the Micro-SIM card tray, and the left edge features the volume rocker key. All the keys are made of plastic and offer decent tactile feedback. The 3.5-mm headset jack sits at the top edge of the Nexus 5, while the Micro-USB port and speaker grill sits at the bottom edge. 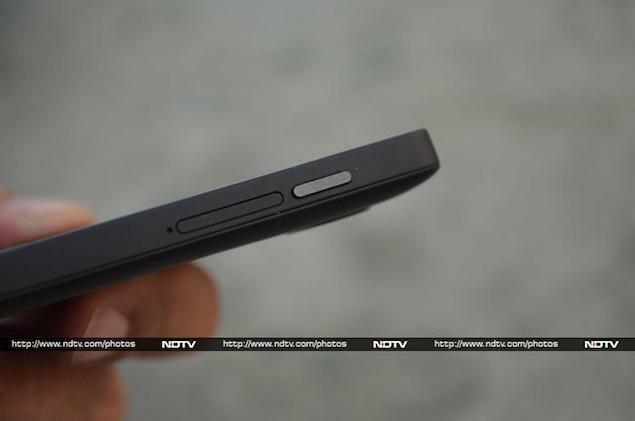 As we mentioned, the back of the Nexus 5 sports a matte soft touch finish giving it a good grip. It is a bit susceptible to smudges, though. 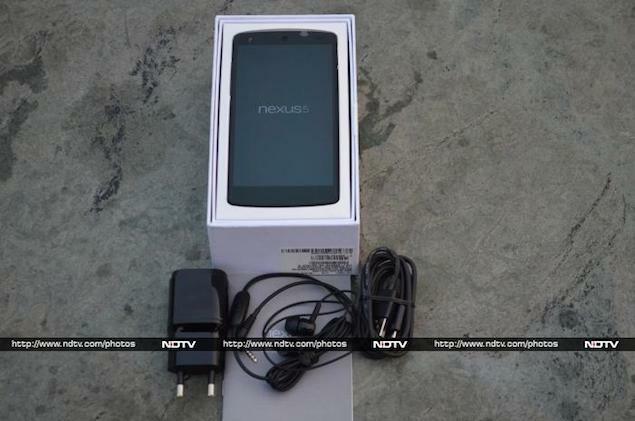 The rear features an 8-megapixel ring shaped camera lens and the LED flash, apart from LG and Nexus branding. 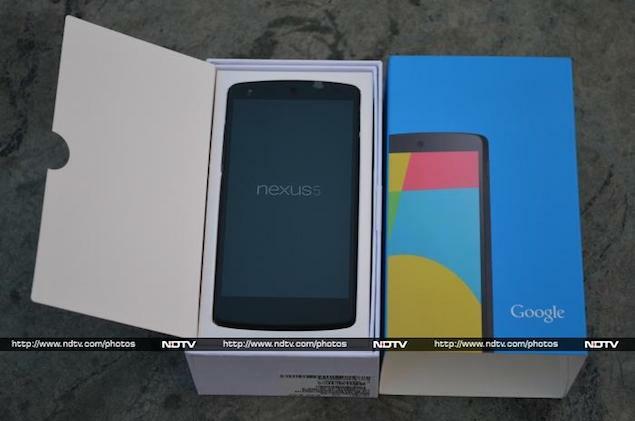 The Nexus 5 comes with an IPS LCD display with a resolution of 1920x1080 pixels and pixel density of 445 ppi. The display comes with Corning's Gorilla Glass 3 protection making it resistant to scratches. In our use, we found the Nexus 5's screen to be very bright, with text and images looking crisp and sharp. Colours looked vivid and not oversaturated like they look on AMOLED display though blacks don't look very deep. The screen delivers great viewing angles, though it was a little reflective. Sunlight legibility was good though the screen brightness levels could be better. 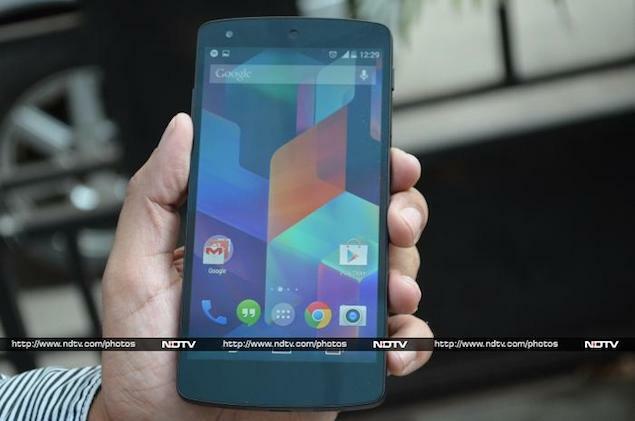 Overall, the Nexus 5's display is one of the best in its class. The Nexus 5 is the first smartphone to ship with Android 4.4 KitKat, the latest release of the operating system. As with all Nexus devices, the phone includes the stock build of the operating system, without any additional UI skinning. 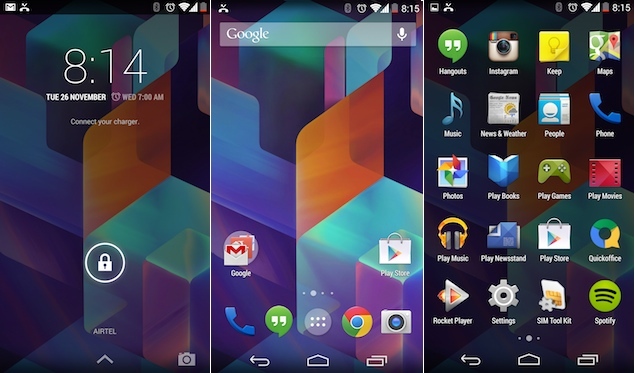 Android 4.4 KitKat on the Nexus 5 features a number of visual changes including a new launcher, making the interface even more minimalistic. It sports flatter design elements, muted colours in status icons, transparency, and smoother transition animations. The first change that you'll notice is the transparent status and navigation key bars at the top and bottom, making the Nexus 5's screen look bigger and brighter. 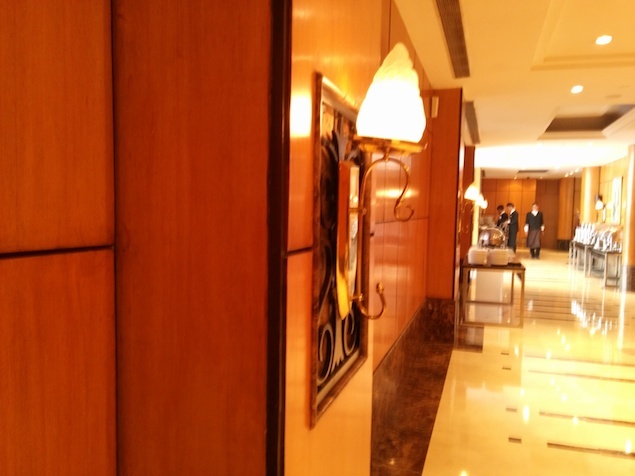 The Android 4.4 KitKat lock screen also features a small camera button, which helps in opening the camera app via the lock screen widget directly from the lock screen. With Android 4.4 KitKat, you can now have as many home screens as you want by simply dragging an icon or placing a widget on a new one. After enabling Google Now, Google's smart assistant that fetches information and offers updates based on your data and usage behaviour, you'll see that the left most home screen would be Google Now pane with information cards and a search bar. The screen can also be invoked by swiping up the screen from the Home button. The Google search bar with the voice search icon is present on all home screens and cannot be removed. Interestingly, you can also initiate voice search from the Nexus 5 when it's in the unlocked state by simply saying, 'Ok Google.' The option is only available when you choose US English as the default language option in the Google Now app's settings, though. With this change, Google search is integrated deeply with the phone. The status bar icons and and UI elements in the notifications tray have been stripped off the blue colour in Android 4.4 KitKat, and now sport a muted white-grey shade. The launcher has been revamped with icons looking bigger than their Jelly Bean avatars and dots are used to indicate the pagination in the home screen and app launcher, similar to iOS. When you launch the KitKat app launcher or go back to the home screen, you'll notice a smooth fly away animation. The app launcher now only features app icons and gets rid of widgets. Due to the larger icons, you'll see a 4x5 grid instead of a 5x5 grid. 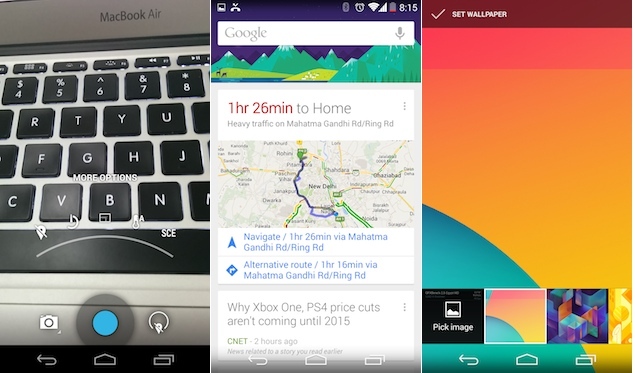 Long pressing on the home screen brings up the menu to change the Wallpapers, Widgets and Google Now settings. The choice of default still wallpapers, live wallpaper and custom wallpapers are now available under a single menu. The KitKat notifications tray features notifications that can be expanded by using two finger pull. It also features buttons for clearing all notifications and for displaying toggles for Brightness, Settings, Wi-Fi, Network, Battery, Aeroplane Mode, Bluetooth, Location settings and Alarm clock. Android 4.4 KitKat also includes an immersive mode that hides the status and navigation bars offering a full screen experience in apps. Apps like Google Play Books already support this mode and developers can choose to enable it for their apps. The OS also allows developers to display semi-transparent navigation and status bars. We've not seen any apps that take advantage of this feature, however. Android 4.4 also includes a revamped Phone app that now automatically prioritises your contacts based on the people you talk to the most. When you first launch the app, you'll see a screen that displays a search bar, a place where most frequently called contacts and favourites are displayed and shortcuts to launch all contacts, the dialling pad, call history and settings. You can also search for nearby places and businesses, contacts, or people in their Google Apps domain directly from the search bar. If you receive a call from a phone number that is not saved in your contacts, the Android 4.4 KitKat-based Nexus 5 will look for matches from businesses with a local listing on Google Maps. We felt that the new Phone app could be a little overwhelming for some as it's not very intuitive when it comes to describing what the shortcut keys do. However, the search feature packs in an online phone directory in the app. 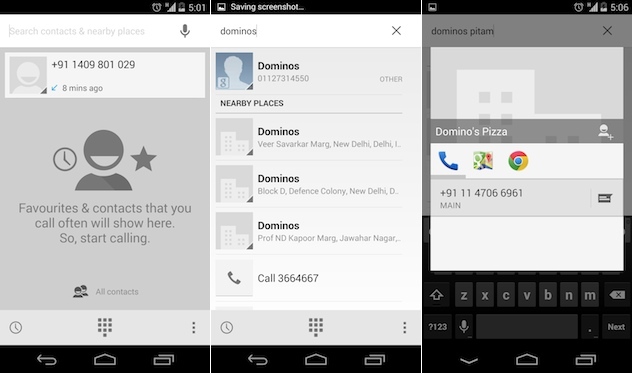 It will even fetch numbers for users who've registered their phone numbers with Google. The number identification feature also works for incoming calls eliminating the need for apps like Trucaller. 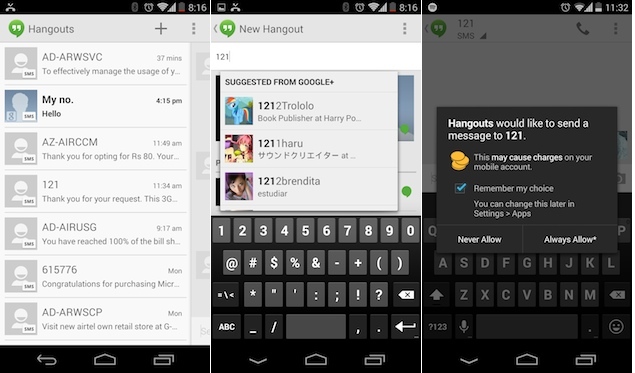 Google has also combined its chat service and the Messaging (SMS) app into one app, Hangouts. The app lets you chat with your friends who use the Hangouts (erstwhile Google Talk) service and send messages to contacts. For people who don't actively use Google's instant messaging service or Google+, there's no value add that the unified app offers. It could also confuse these users if they've got unkempt Google+ profiles as it lists Google contacts on top when you want to compose a new message. The Nexus 5 also includes the new Photos app that allows you to view and edit local and Google+ images. The new Photos app features deeper integration with Google+ and can be used to enable tagging in photos. The old Gallery app is still included in the app, though. The Email app has also received an overhaul with KitKat, and the app displays the pictures of contacts for emails. Navigation has been made similar to the Gmail app and it also offers the swipe to delete gesture. Google also includes its other apps including Drive, Keep, Play Games, Play Movies, Play Movies, Play Books, Play Newsstand and Quickoffice for creating and editing documents, spreadsheets and presentations. The new OS also supports printing through Google Cloud Print plugin or apps made by printer manufacturers. Overall, KitKat on the Nexus 5 is an improvement when it comes to the overall experience of using the phone, though there's till some scope for improvement, especially in apps like Hangouts. The status icons are also inferior at offering feedback compared to the ones seen in previous versions of the OS. 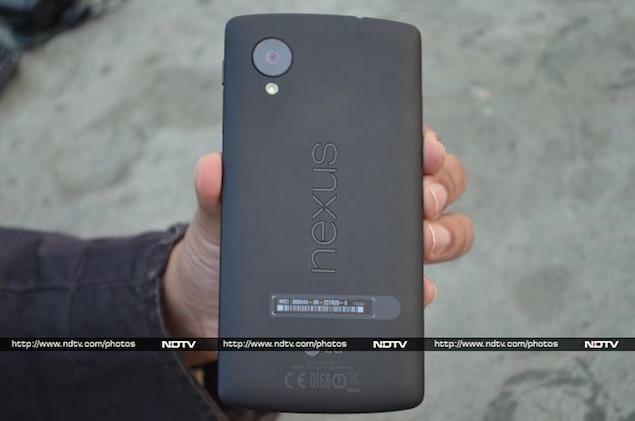 The Nexus 5 sports an 8-megapixel rear camera with Optical Image Stabilisation, and a 1.3-megapixel front facing camera. The phone features the stock Android 4.4 Camera app with 4 default shooting modes - Still, Video, Panorama and Photo sphere (360-degree). In the Still mode the app features settings for turning on HDR+, tinkering with Exposure, turning the LED flash on or off, switching between the front and back lenses and revealing more settings that include Geotagging toggle, Countdown timer, changing the picture size, White balance and the scene mode (Night, Action, Sunset, and Party). Similarly, in the Video mode, you can change video quality settings (1080p, 720p or 480p), Time lapse, Exposure settings and Flash. We have to say that we're no fans of the nested arc shaped settings toggles and find the app a bit unintuitive. 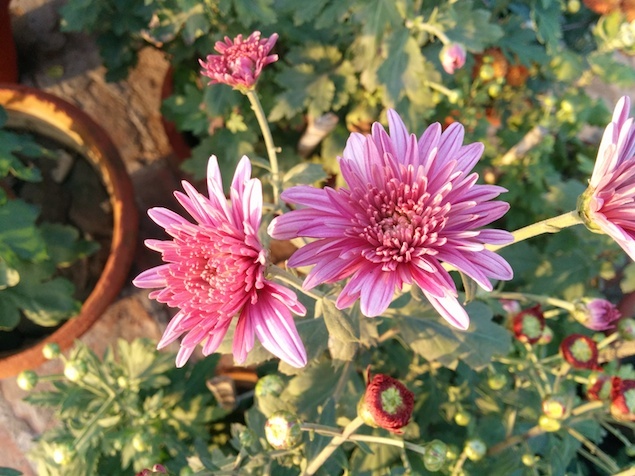 Putting the camera of the Nexus 5 to test, we observed that images taken outdoors during daylight came out a tad brighter. 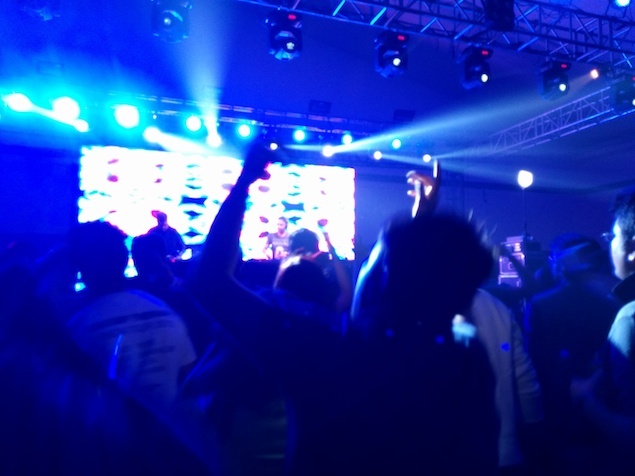 However, there are a number of issues with the phone's camera that we encountered in our use. We observed that auto-focus is not consistent, and focusing manually takes time resulting in images being different from what we desired. We also observed that there was a slight lag between the time we fired the shutter and when the phone captured the image. Comparing images with the ones taken with an iPhone 5 in the same settings revealed that the white balance on the Nexus 5 camera (in the default mode) is skewed towards the warmer end of the spectrum. Low-light shots were also not up to the mark and had noise. The camera does a good job for shooting videos and supports 1080p video capture. The 1.3-megapixel front shooter does a decent job for video calling and taking self clicks. It supports 720p video capture. Overall, the Nexus 5's camera is underwhelming at best. We hope Google pushes out a software update to fix the focus issues and shutter lag. The Nexus 5 comes with top of the line hardware (at this point in time), as it is powered by a quad-core 2.26GHz Qualcomm Snapdragon 800 processor with 2GB of RAM, and an Adreno 330 chip for processing graphics. Our review unit had 32GB of built-in storage (a 16GB variant is also available), out of which 26.7GB is available to the user. The phone doesn't offer a microSD card slot for expandable storage. The overall experience of navigation through the Nexus 5's interface was extremely impressive, thanks to all the power under the phone's hood and the UI being devoid of unnecessary bells and whistles such as transition effects. We did not experience any lag at all while launching apps, playing games, scrolling web pages or switching between apps on the Nexus 5. The gaming experience on the Nexus 5 was pretty good with games like Temple Run 2, Subway Surfers, Shadow Gun: Dead Zone and Asphalt 7 running without encountering any issues. We were able to run a number of video formats except for full-HD MOV and AVI through the native video player on the Nexus 5. We also experienced some issues with audio while playing an MKV format video. This was easily fixed by downloading a third-party video player. The phone then plays full-HD videos without any issues. The speaker on the Nexus 5 is another pain point. It delivers below average quality sound at high volume levels and the sound gets distorted. However, the speaker grill is located at the bottom edge so the sound doesn't get muffled when the phone lies on its back. Notably, the Nexus 5 doesn't include FM radio functionality. Call quality was good on the Nexus 5, and we were able to receive cellular signals even in low signal areas. The Nexus 5 comes with a 2300mAh battery, and in our usage, it lasted us just about a day with medium usage, including 1-1.5 hours of phone calls, two e-mail accounts with push notifications, playing some music, clicking a few pictures, Twitter notifications and WhatsApp chats. It's worth pointing out that we had mostly used 3G data with intermittent use of Wi-Fi and had put the phone's screen brightness at the highest level. Altering these settings might help in running the phone for a longer duration, depending on your usage pattern. The Nexus 5 also includes NFC capabilities, and we were able to transfer and receive files through Android Beam, which combines Bluetooth and NFC for sharing data. The phone also allows you to transfer files to other devices through Wi-Fi without being on the same Wi-Fi network. 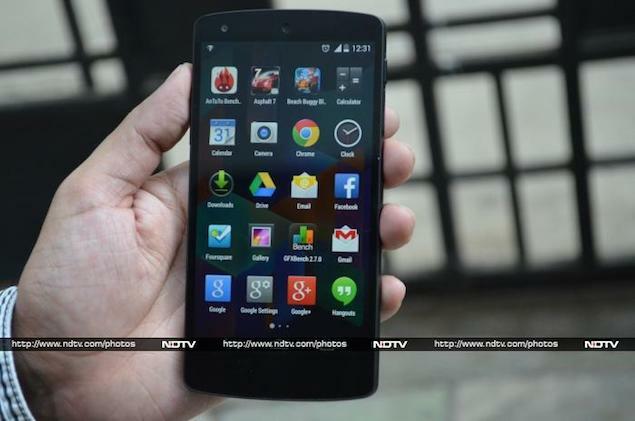 The Nexus 5 is one of the best Android smartphones that you can buy for under Rs. 30,000. Powered by a Snapdragon 800 processor, and 2GB RAM, the phone ticks all the right boxes in terms of hardware specifications. Since it's a Google experience device, you're always assured of regular software updates (at least for the 18 months promised period). These two big factors do partially offset the main disadvantages of the phone, namely its mediocre camera, lack of external storage support and underwhelming battery backup. Google may or may not bring a software fix to resolve the issues (if these are due to the software limitations) but even assuming that this is not the case, the starting price of Rs. 28,999 makes the Nexus 5 a great deal. We can't think of a phone in this price range that delivers the same value.